We address the rating-inference problem, wherein rather than simply decide whether a review is "thumbs up" or "thumbs down", as in previous sentiment analysis work, one must determine an author's evaluation with respect to a multi-point scale (e.g., one to five "stars"). 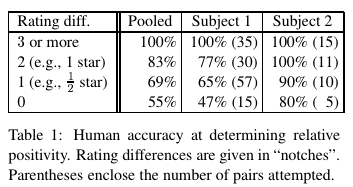 This task represents an interesting twist on standard multi-class text categorization because there are several different degrees of similarity between class labels; for example, "three stars" is intuitively closer to "four stars" than to "one star". We first evaluate human performance at the task. Then, we apply a meta-algorithm, based on a metric labeling formulation of the problem, that alters a given n-ary classifier's output in an explicit attempt to ensure that similar items receive similar labels. We show that the meta-algorithm can provide significant improvements over both multi-class and regression versions of SVMs when we employ a novel similarity measure appropriate to the problem. This paper is based upon work supported in part by the National Science Foundation (NSF) under grant no. IIS-0329064 and CCR-0122581; SRI International under subcontract no. 03-000211 on their project funded by the Department of the Interior's National Business Center; and by an Alfred P. Sloan Research Fellowship. Any opinions, findings, and conclusions or recommen- dations expressed are those of the authors and do not necessarily reflect the views or official policies, either expressed or implied, of any sponsoring institutions, the U.S. government, or any other entity.